Tortilla de patatas (potato omelette) is also sometimes called Tortilla espanola de patatas (Spanish omelette) to differentiate it from the dish commonly known as tortilla francesa (French omelette) or just tortilla, which is made only with eggs, as well as from the Mexican/Mesoamerican tortilla made from maize/corn or wheat flour. It is a very popular dish at any kind of event in Spain and can be served either cold or hot. It is also served as a tapas dish. 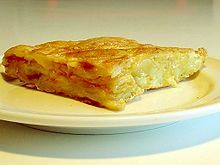 Although potatoes and eggs are the basic and in most cases the only ingredients of a tortilla de patatas, other vegetables can also be found accompanying it such as onions and, more rarely, red peppers, chives, artichokes, ham or even chorizo, and then it is called tortilla paisana. Peel the potatoes and cut them into small cubes or thin round slices. Sprinkle with salt and leave any excess water to drain from them while heating the oil to around 350°F (177°C) in a large frying pan. 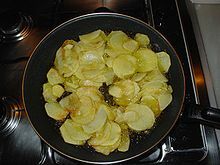 Fry the potato chips until they are very slightly golden, although this is a matter of taste: the more golden and crisp the potatoes are, the more juicy will be the omelette. For a dryer and thicker tortilla, turn the heat down and let the potatoes cook gently until tender and soft. Remove the potatoes from the oil and drain. Beat the eggs, add salt to taste and mix with the potato chips. Leave them to soak for 10 minutes. Next, heat 1 tablespoon of the olive oil in a frying pan and, when it's smoking hot, add the potato and egg mixture. Use a smaller frying pan so you will get a thicker and well rounded omelette. Shake the pan to avoid the omelette sticking or burning. After a few minutes, turn the omelette over with the help of a flat lid or a large dish, and leave until golden on the other side. Serve hot or cold accompanied by a salad. This page was last edited on 15 December 2016, at 22:29.